After a long day’s work, and all the boring ordeals of life, isn’t it absolutely comforting to sit on the soft couch and relax while your favorite TV Show is being played? Isn’t it absolutely enthralling when on a holiday you binge watch or catch up on missed episodes of your favorite Rom-Com with your loved ones? Yes, TV holds a place that in your life that is of paramount importance. So why simply put it up on a wall, or in a simple, uninspired cabinet that is dull and boring, unlike the lands you go to on the TV? 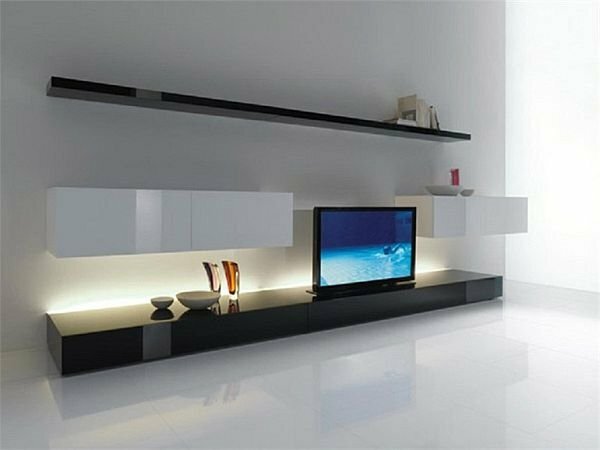 Fret not, dear readers, for here we have listed some absolutely brilliant designs for TV cabinets. 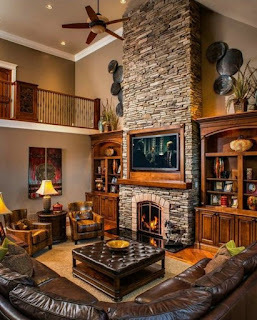 Apart from providing a humble resting place for your entertainment portal, it will impart a desired look to your living room as well. You can choose from a variety of options that exist. Such as wall mounted units, that allow for saving a lot of space and maximize flor usage, or a minimalist storage furniture that acts as a dual purpose unit, or even other personalized modular designs and arrangements can be created according to the room specifications and material requirements. Creativity is the key! 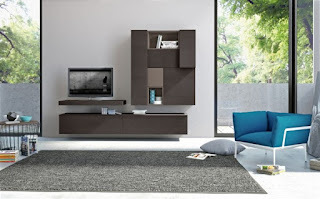 This is a brown colored minimalist design of TV Cabinet. 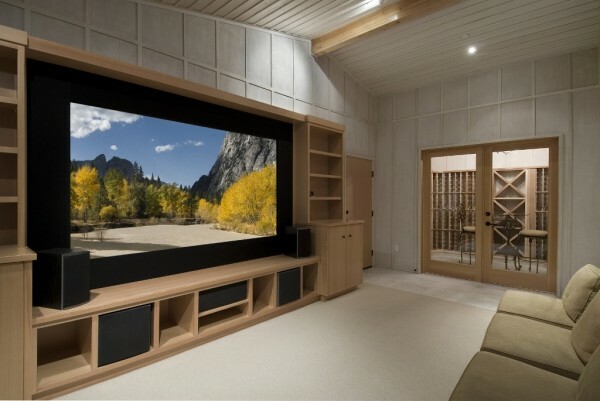 It features a set of multiple shaped units that are group together, though inherently separate, to provide a various storage options and a wall mount for TV. It lends a flowing work space in your room, and is actually quite classy and useful at the same time. 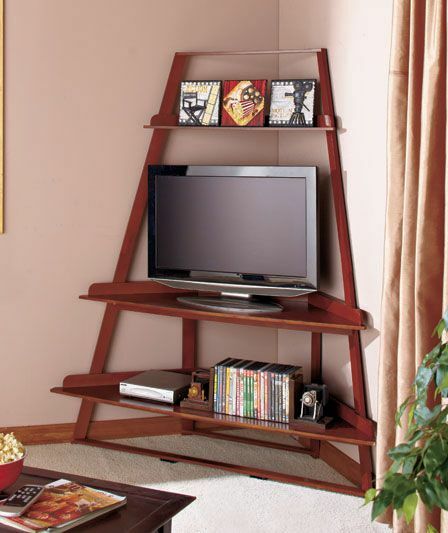 You can store DVDs, cassettes, or even your favorite books on the side cabinet and it blends perfectly with the room. If you love to play and experiment with colors and are a fan of sleek furniture work, this is your deal. With a bright golden back drop and stunning white cabinets, the whole affair is a match made in heaven. This one doesn’t not mount the TV, but keeps it simply on the cabinet. It is pretty useful if you tend to keep shifting the position of your TV unit, because unlike wall mounted cabinet, this is not fixed. The looks say it all! Brown colored matte cabinets with pristine white colored lamps marry the room and aura perfectly! The sleek design and low space occupying cabinet can hold a TV unit and much more! The drawers can be used to hold much important stuff, that you’d rather hide away. And the top can be used as a display shelf to put out those glorious show pieces on display! The yellowish light emitted from the lamps sure make the atmosphere very soothing. Make way for a crowd of admirers! For this beauty of a cabinet is sure to keep heads rolling. It is a custom made cabinet, that will measure the exact size of your TV unit and carve out a void of exactly the same dimensions, so your TV set fits right into it and blends cleanly with the white board material used. The bottom can be used to keep materials and pieces of decoration to adorn the cabinet. If you have stuff to store, fret not! 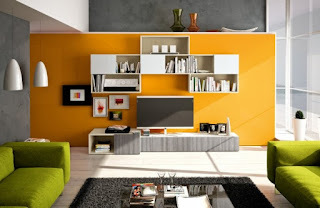 Compartments made behind the TV set can be used to store stuff that is not visible from the front. And amazing blue LED light adds a much appreciated contrast. This is perhaps the most Ultra-Modern design here on this list. It is a pure white albeit glossy curved TV stand that does exactly what it is supposed to, and no less. It holds the TV in place, acting as a stand. And wonderfully so. It is a beauty to behold in itself, owing to the classy curved design. The mere existence of such a design is an ode to the architectural wonders we have achieved! 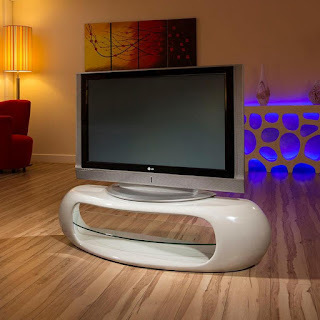 This is a TV Cabinet for those who do not have much space at the center in their room design and want to place the TV set at a corner of the room. This is a wooden beauty that is simple and likely to match with any background your room may have. The design features a three-tier design i.e. it has three levels. The bottom and the top shelves can be used to place certain stuff such as DVDs, books, CDs and cassettes etc. or even your Set Top Box. The middle level is where the TV unit is to be placed, and the whole set up looks absolutely marvelous and stylish. For those who own a luxuriously rich and large Television set. This is a dream come true for all your cabinet needs. Literally, this huge cabinet set can not only hold your large TV set, but also huge loads of other stuff! 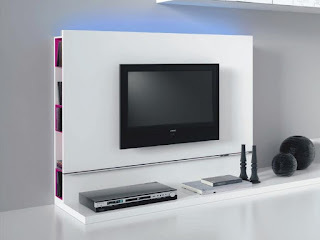 The wall mounted TV stand with shelves on white ceramic floor tile looks pretty awesome, eh? You can keep your speakers, along with books in side cabinets and DVDs, CDs, books, and whatnot! Believe us, you’ll never need another cabinet ever again! This is another gem here on the list. A mass favorite design that is sure to be loved and adored by everyone! This Cabinet is a set of cabinets. Yes, you heard it right! It has so many boxes to store any amount of stuff you want to, and as a cherry on the top of this super sweet cake, it can be used and placed at places with not much space available, owing to its compact yet super spacious design. 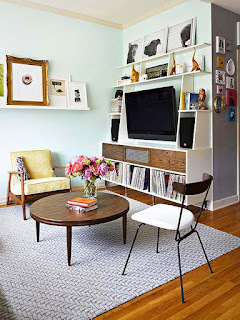 The white color and the center placement of the TV set lends a very beautiful look to the whole unit. You can add a personal touch by placing photo frames at the top too! If you love wooden work and want to impart a very classic look to your living room, look no further! This TV cabinet design is sure to keep you hooked. The dark wood used to make this cabinet is very sturdy and the design is quite unique in the sense that normal cabinets go from bottom to top, but this one goes from top to bottom. Just like a hanging! Prepare to hear your guests gasp and a long string of ‘Oh My God!’s. because we have got the most amazing TV cabinet design for you here! It’s simply a wooden box but when it fits into a fireplace, voila! There you have a wonderfully snug looking match made in heaven. If your house is majorly woodwork, this is a design you must approach. The overall look imparted is medieval classic. Just like the brilliant old times! So. Here we come to the end of this amazing and unexplored journey into some pretty useful and brilliantly crafted TV cabinet designs. Have a look again and select the one that matches your house profile, and go for it! Because your TV deserves better!